With years of Side Mount diving experience, two of the sport's most acclaimed explorers, Brian Kakuk and Jill Heinerth, have teamed up to share their expertise with you in this generously illustrated and practical manual. For open water, wreck, and cave diving enthusiasts. Featuring: Wes Skiles, Lamar Hires, Jakub Rahacek, and Steve Bogaerts. 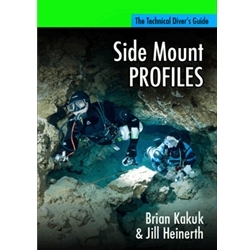 The ultimate sidemount diving book by Brian Kakuk and Jill Heinerth.